"In the name of the higher interest of the nation and with a concern to preserve peace and avoid the country's collapse in chaos and violence?.I take responsibility and commit to lead a string republican opposition": so said jean Pierre Bemba, defeated at the presidential runoff by Joseph Kabila. 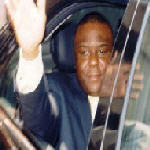 Speaking on TV, Bemba did not a sense of frustration at how the Supreme Court handled his appeal. He did ask all political and social forces to "join his battle such that, together and reorganized, they may ensure the reconstruction of Congo. Joseph Kabila, was nominated to be leader of the country in 2001 after the murder of his father Laurent-Désiré. He is now the first president elected by direct universal suffrage having won 58% of the votes.